Interior - Interior furniture is finished with Sikkens DEK Natural (078) for a durable, rich finish. Oil finishes require periodic touch up. 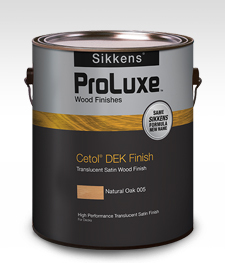 Sikkens is easily applied with a rag or brush. Exterior - Outdoor furniture is finished with Sikkens DEK Natural (078), a very durable oil finish that resists sun damage. After 6-12 months in the sun, the finish will need to be reapplied. Raised wood should be lightly sanded with fine sand paper to restore a smooth finish. Click the link to the right for Over a Barrel's current price list. Prices are subject to change, and when applicable California sales tax applies. Contact us on your next trip to Paso Robles and we will arrange a private showing. Over a Barrel furniture can be shipped anywhere in the US. Contact us for a shipping quote. We do not mark up shipping. Our furniture has been shipped to California, Florida, Pennsylvania, Tennessee, and Texas. Deliveries in Paso Robles / Templeton / Atascadero area are free. The rest of San Luis Obispo County is $30.